After trading for New York Rangers third-string keeper Marek Mazanec yesterday, the Vancouver Canucks are returning to some semblance of a normal situation in net. The team announced that starter Jacob Markstrom has been cleared to play and will get the start tonight against the Anaheim Ducks. Mazanec will be the backup, and if Markstrom can’t hold up, could make his first NHL appearance since 2016-17 after exclusively playing in the AHL the past two years. As for Michael DiPietro, the young prospect is on his way back to the OHL’s Ottawa 67’s, as his emergency loan has come to an end. DiPietro allowed seven goals on 24 shots in his NHL debut on Monday, a forgettable performance that he’s unlikely to forget. Meanwhile, the team did not issue an update on backup Thatcher Demko, Vancouver’s other top young goalie, who is currently on the injured reserve with a knee injury. If the Canucks hope to sneak into the playoffs, they’ll likely need both Markstrom and Demko to get healthy for the stretch run. As usual, Sportsnet’s Elliotte Friedman provided plenty of insider information in his latest edition of “31 Thoughts”. An encouraging note for Ducks fans, especially during a stretch without much good news in Anaheim, is that Friedman claims term is the only thing separating the team and winger Jakob Silfverberg from agreeing to a contract extension. While that means the two sides are still apart, it was cap hit that was the major roadblock to a new deal. Due to Anaheim’s overall lack of cap space and the restrictions of “tagging”, many speculated that Silfverberg’s desired salary would be too difficult for the Ducks to manage. The fact that term remains “the final hurdle”, as Friedman puts it, would seem to indicate that the dollars have been agreed upon and a the odds of a new contract getting done are better than not. Friedman adds a new name to the list of Edmonton Oilers GM candidates. While he maintains that Vegas Golden Knights AGM Kelly McCrimmon and former Toronto Maple Leafs executive Mark Hunter remain popular options, he also adds Boston Bruins AGM John Ferguson Jr. to the mix. Friedman notes that interim GM Keith Gretzky, who appears to have some job insurance moving forward even if it isn’t at his current position, has experience working with Ferguson from his own time with the Bruins. Ferguson is a well-respected NHL executive who previously served as the Toronto Maple Leafs GM from 2003 to 2008 and has been with the Bruins for the better part of this decade. This also isn’t the first time that his name has come up in regards to an opening; Ferguson was considered a candidate to run the Vegas Golden Knights and has already been considered a candidate to do the same with the Seattle expansion team. However, GM jobs don’t come around very often and, like McCrimmon, if Ferguson is offered the Edmonton job, is unlikely to pass in favor of waiting on Seattle. One last interesting note comes in regards to the Arizona Coyotes. Friedman points out that the Coyotes are struggling with so many injuries that their AHL affiliate, the Tuscon Roadrunners, could only ice a lineup of 17 skaters last night, playing a man down. CapFriendly’s depth chart shows that only 15 skaters under contract with the ’Yotes, including just nine forwards, are currently in Tuscon, as Arizona needs all the help they can get at the NHL level. 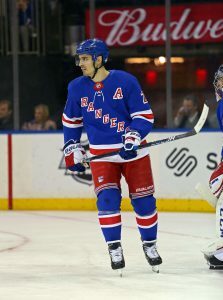 Fortunately, Mario Kempe, Brad Richardson, and Christian Dvorak are all getting close to a return, while Michael Grabner and Jason Demers returned to practice today writes The Athletic’s Catherine Silverman. The closer the Coyotes get to full health this season, the better their chances are to push for a playoff spot in the tight Western Conference race. The Vancouver Canucks needed a goaltender, and they needed one now. Instead of waiting for a chance to reclaim someone like Mike McKenna, the team has traded for New York Rangers netminder Marek Mazanec. The Canucks will send a 2020 seventh-round pick to the Rangers. Vancouver had been using junior goaltender Michael DiPietro as their backup recently, and even gave the 19-year old a start yesterday. It didn’t go well as DiPietro allowed seven goals on 24 shots against the Western Conference-leading San Jose Sharks. Keeping their prized young goaltender in the NHL to sit on the bench or get shelled by competition he’s never seen before just isn’t a good development strategy, meaning the Canucks needed to add another body of some sort. Mazanec will become that body, as he too doesn’t bring a ton of NHL experience to the table. The 27-year old has played 31 games in the league but 25 of those appearances came back in 2013-14 with the Nashville Predators. After heading overseas for a short period last season, Mazanec returned and has a .903 save percentage in 20 games for the Hartford Wolf Pack. There’s little reason to believe that he will be a long-term solution in Vancouver, but at this point the team will take what they can get. Vancouver has also recalled Adam Gaudette from the minor leagues, giving them a full 23-man roster as they prepare for a road trip through California. Seven games are on tap for tonight across the NHL, including a prime time matchup between the New York Islanders and Washington Capitals. The Islanders are trying to prove all of their doubters wrong and continue to compete in the Metropolitan Division, while the Capitals are ready to contend for their second Stanley Cup. As teams prepare for tonight’s action, we’ll keep track of all the movement around the league. The Nashville Predators have placed Zac Rinaldo on injured reserve, though the physical forward hasn’t played since the beginning of the month. Rinaldo has actually played 23 games for the Predators this year, more than many expected when he signed a one-year two-way deal in the summer. The New York Rangers have flipped backup goaltenders once again, sending Alexandar Georgiev to the Hartford Wolf Pack and recalling Marek Mazanec. The team has been making these moves all season in order to keep their backups fresh, and the two will likely be flipped back within a few days. The Minnesota Wild have recalled defenseman Louis Belpedio from Iowa of the AHL. With Mathew Dumba on IR, Minnesota has been running with six defenders for the last little while. Belpedio has 10 points in 40 minor league games this season and has two assists in his lone career NHL contest. The Dallas Stars have brought back winger Denis Gurianov from AHL Texas. The 21-year-old impressed in an 11-game stint earlier this season and has been quite productive in the minors with 31 points in 29 games. Dallas has scored just three goals in the last four games so they’ll likely be hoping that Gurianov can help give them a lift offensively. The NHL has a light schedule tonight with just four games, though there are still some prime matchups. Arguably the two best lines in hockey will face off when Nathan MacKinnon and the Colorado Avalanche welcome in Patrice Bergeron and the Boston Bruins, while Mike Yeo will try to cool off his seat as he heads to Chicago to face the Blackhawks. We’ll be right here to keep track of all the minor roster moves around the league as all those teams without a game prepare for the second half of the week. The New York Rangers flip-flopped goaltenders once again, recalling Marek Mazanec while assigning Alexandar Georgiev to the minor leagues. Then, later in the day they reversed the transaction, calling Georgiev back up and demoting Mazenec in what appears to be nothing more than a paper transaction. The team has made the swap several times this season, though Mazanec still hasn’t gotten into any NHL games. The Rangers are keeping both goaltenders as fresh as possible by giving them time in net for the AHL’s Hartford Wolf Pack. Nikita Scherbak has been recalled from his conditioning stint, as the Montreal Canadiens had used all 14 days available to them. The young forward will continue to get treatment for his lower-body injury instead of joining the team, and it is not clear when he will be given the chance to get back into the NHL lineup. After Sidney Crosby missed practice with an upper-body injury, the Pittsburgh Penguins have recalled Derek Grant from the AHL. The veteran forward played today for the Wilkes-Barre/Scranton Penguins, and may get into the lineup along with newcomer Tanner Pearson tomorrow night for Pittsburgh. The Anaheim Ducks have recalled Sam Carrick from the San Diego Gulls, after moving both Cam Fowler and Patrick Eaves to injured reserve. Carrick has played three games already this season for the Ducks, but has found most of his success in the minor leagues where he has 11 points in 10 games.